I've recently been applying a principle to my life that actually has applications in a lot of places, not least in running a consulting or agency business. 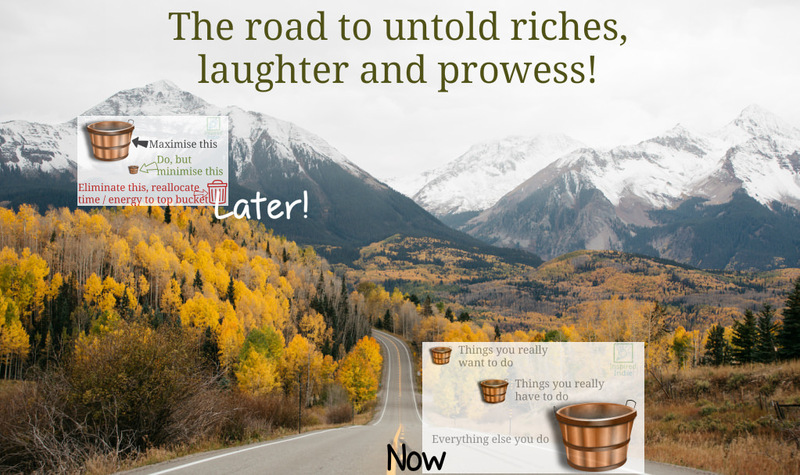 It's really quite simple, and is the key to everlasting happiness, untold riches and success beyond your wildest dreams! Maybe I should create a brand around it and get into the pop self-help game. Or maybe it can be encapsulated here in a blog of less than 400 words. There are, of course, countless nuances and caveats. But at its essence, it's simple to grasp, but never-ending and hard to implement. So when I say "I've been applying it", what I really mean is "I totally get how it works, and am trying my darndest to consistently do it". It also underpins our Values Led Consulting approach, but is useful with or without that. So, with no apologies for framing the bleeding obvious, here it is. Got to love that miscellaneous / everything else bucket, right? Easy way to ensure everything is captured. But the point is that for many (if not most) people, that "Everything Else" bucket is at best too full, and at worst the fullest bucket of the 3. Activities like inane browsing or social media. Eating junk - not because we desperately want it, but simply because it's there and easy. Watching crap on TV. Shopping to pass the time. Tidying up something that it makes no real difference whether it's tidy or not. It's the same for a business. 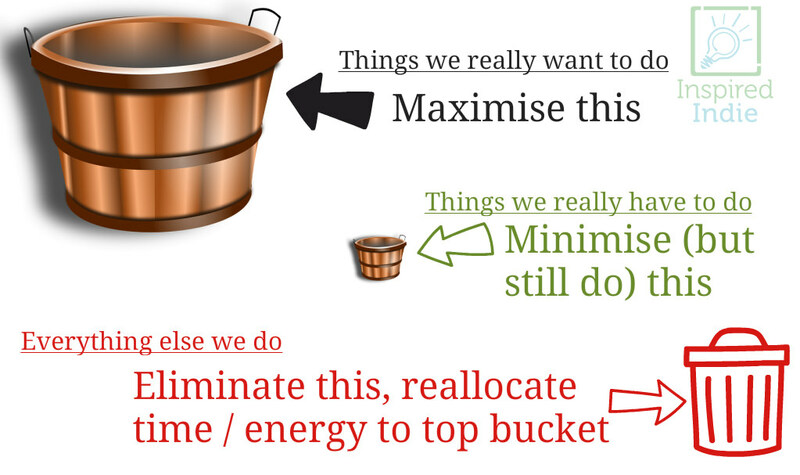 Most businesses I have been in or worked with have an "everything else" bucket that is much fuller than it should be. Filling in forms that add no value. Following learning and development processes for the sake of having done it, rather than actually progressing learning and development. Following vanity projects that don't further your goals, but are continued simply because they were started. Eliminate everything else (Bucket 3). This brings home the importance of creating your business around your vision and values as we do in our Values Led Consulting. If you have clarity around your consultancy's vision and values, then you have a filter to apply whenever you evaluate options for anything your business does. Of course, there will be many factors not making this a very quick, or even consistent process. For instance, when I was at Conchango during the heydays of 2 dot com booms, we couldn't move for tripping over massively innovative projects, which all fell into the "really want to do" bucket. However, in the economic busts which followed, although we still wanted and looked for those innovative projects, there was little corporate appetite for innovation. 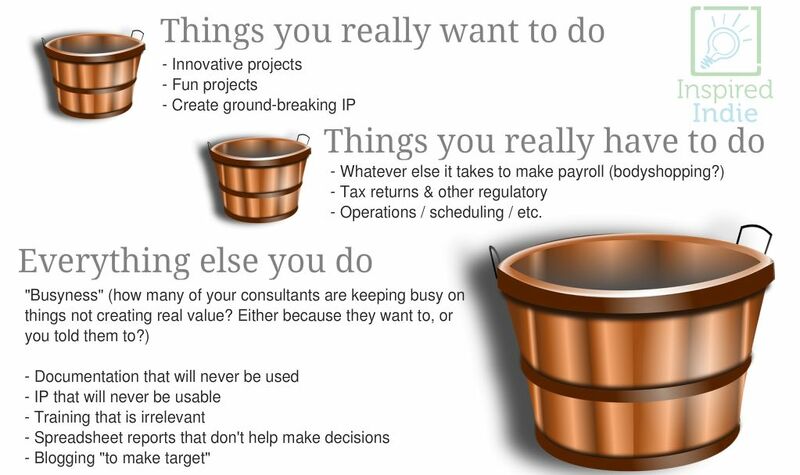 From our perspective, the need (and want) to keep our consultants in jobs outweighed our desire for innovative projects. So we took some "bodyshopping" gigs, which in normal circumstances we'd have hated to take. The fact we'd done so much innovating in the booms meant that where someone was still innovating during the bust, we were very well lined up for those projects. But the definitions of "really want" and "really have to" had shifted somewhat. Does it align with your vision and values? Then it's in (1), and you should do a lot of it! Is it a requirement for your business? Then it's in (2), and you should minimise what it takes to get it done, or see if it can also be made something you really want to do (1). Odd though it sounds, that's effectively what we made our Ops function be - something we really wanted, rather than a painful but necessary procedural function. If it's neither of the above, then why should you do it at all? The best answer is "you shouldn't", and find something that's of real value to your business instead. To further simplify this into a single(ish) question, before doing anything of any substance for your business, ask yourself "Is this something we really want to or have to do? If not, then what should we be doing instead?". I know it seems ridiculously simple. But can you with a clear conscience say that your decisions are made with that principle in mind? I know that it's still a journey I'm always on. So my wish for you for 2017 is that your business only does what you absolutely want it to do in alignment with your vision and values, or what the government dictates that it must. And nothing else. Right. I'm off now to make this ridiculously simple thing into a multi-billion dollar brand to take on Anthony Robbins.